Hōne Tōia and his followers were arrested following what has been described as the 'dog tax rebellion'. Tōia ( the sole standing prisoner) was a prophet whose faith was 'Whiowhio'. He communicated with the unseen world through Te Nākahi (the serpent), as had the earlier prophet, Papahurihia. 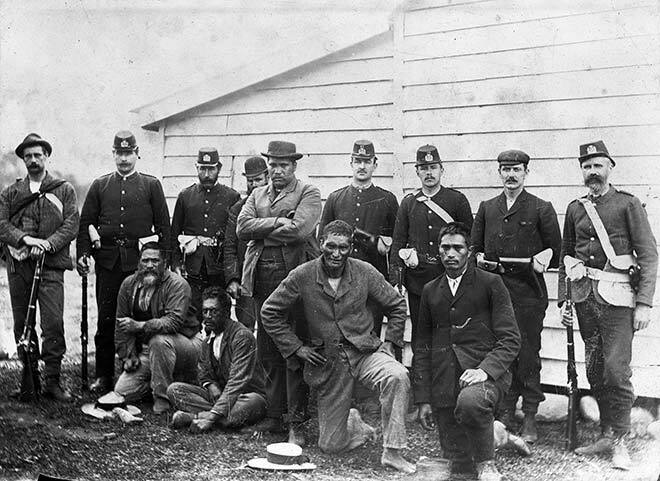 These police constables standing behind their prisoners are (from left) Charles W. Hendrey, John W. Skinner, Alexander McGilp, John Beazley, John McNamara, Edward M. Johnson, William McNeely and Douglas Gordon. In front of them are (from left) Romana Te Paehangi, Hōne Mete, Hōne Tōia (standing), Wiremu Te Makara and Rakene Pahe.